Currently showing on The Discovery Channel, the new ten-part documentary series Extreme Dinosaurs is proving to be something of a tour-de-force, combining the very latest palaeontological research with state-of-the-art computer generated animation techniques. It is already an incredible success, drawing record audiences around the world. Nevertheless, it has come under fire from a number of respected experts in the field, who claim that the makers have sacrificed accepted academic thinking about prehistoric animals for the sake of sensationalism. We invited the show&apos;s producer, Jerry &apos;Mack&apos; McIntyre to comment on these criticisms. The University of the Bleeding Obvious: Mr McIntyre, The Discovery Channel has spent a great deal of money on this series, and if the ratings are anything to go by, it seems that it was money well spent. All the same, it must be quite disappointing that your efforts have not been recognised by the academic community. Mack: It is quite frustrating, yes. Certainly, this is a commercial enterprise and we are out to appeal to as many people as possible. But it&apos;s not just about entertainment: our aim - our &apos;mission statement&apos; if you like - is to educate and inform. 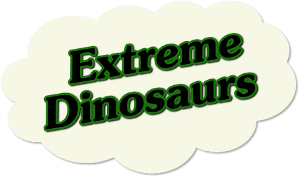 With Extreme Dinosaurs we feel we are doing just that. UBO: One criticism that has been levelled at you is that the depiction of these animals is based largely on supposition. Do you feel that you are the victims of academic snobbery? UBO: Or that the stegosaurus was a keen water-skier? Mack: Exactly. 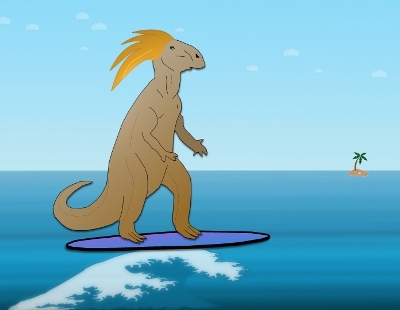 Recent research has indicated that the stegosaurus was equally at home on land or water, so it&apos;s reasonable to assume that it would have been quite an accomplished water-skier. UBO: It is quite a leap of logic though, isn&apos;t it? It&apos;s not surprising that it&apos;s attracted so much criticism. I must say, I was quite astounded when I first saw the clip of a group of stegosauruses lounging around in the sun and catching a few waves before wandering up to the beach bars. Mack: Well that&apos;s the majesty and wonder of nature for you. Breathtaking, isn&apos;t it? UBO: Well all right, what about the allosaurus then? Mack: Ah yes, the allosaurus. One of the largest carnivores this planet has ever produced. A huge, vicious, terrifying predator. One of my personal favourites. UBO: But is there any actual evidence that they were into hang-gliding? Mack: There&apos;s no evidence that they weren&apos;t.
UBO: That&apos;s not what I asked. Mack: Look here, we&apos;ve had some top notch scientific types on this - people with letters after their names. They&apos;ve spent the best years of their lives studying this stuff. They&apos;ve attended digs, examined artefacts and... and, well, done a lot of very complicated scientific stuff. And let me tell you - they&apos;ve unearthed some pretty compelling evidence. UBO: They&apos;ve actually discovered the fossilised remains of prehistoric hang-gliders? Mack: No, of course not. Don&apos;t be bloody stupid! They&apos;ve discovered a lot of rocks. Mack: Yeah, and the really astonishing thing is that when we look at modern hang-gliders today, we find that there are nearly always rocks in the vicinity. 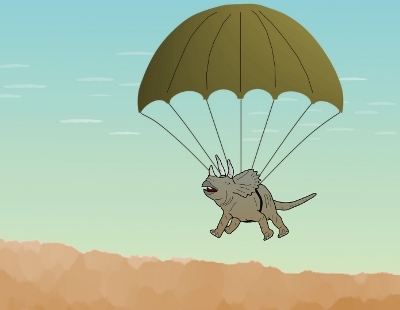 So it&apos;s reasonable to assume that the reverse is true - that where we find prehistoric rocks, we can also expect to find prehistoric hang-gliders. Surely that&apos;s a reasonable conclusion to draw? Don&apos;t answer that, the question was rhetorical. 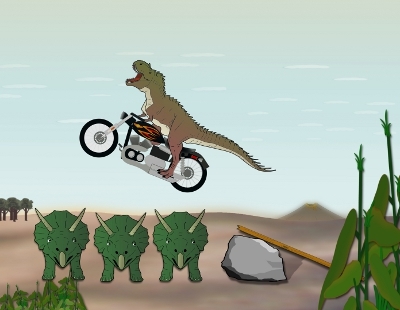 UBO: Very well, I suppose you&apos;ve got equally compelling evidence that sabre-toothed tigers rode motorbikes? Mack: Ah well, this of course is common knowledge. It has been accepted as fact since 1956 when cave paintings were discovered in France, depicting a sabre-toothed tiger popping a wheelie to the amazement and delight of a crowd of lady sabre-toothed tigers. The sequence in our programme is based on that very painting, and the bike is authentically constructed from the materials available at the time - mostly rocks, bamboo, vulcanised coconuts and foam rubber, which scientists believe was in abundance during the cambrian period. UBO: And the leather jacket? And it would seem that artistic licence has been employed throughout much of the series. Look forward to future episodes featuring a skateboarding diplodocus, a parascending brachiosaurus and a plesiosaur called Dennis who holds the world drag-racing record. And we&apos;ve just learned that The Discovery Channel is so pleased with the series that they have commissioned a sequel. Extreme Dinosaur Detectives will feature a gang of crime fighting velociraptors who use their special ninja powers to save dinosaurs in distress.